Ever wondered how to remove fake names of competition and clubs, and enable the German national team in Football Manager? 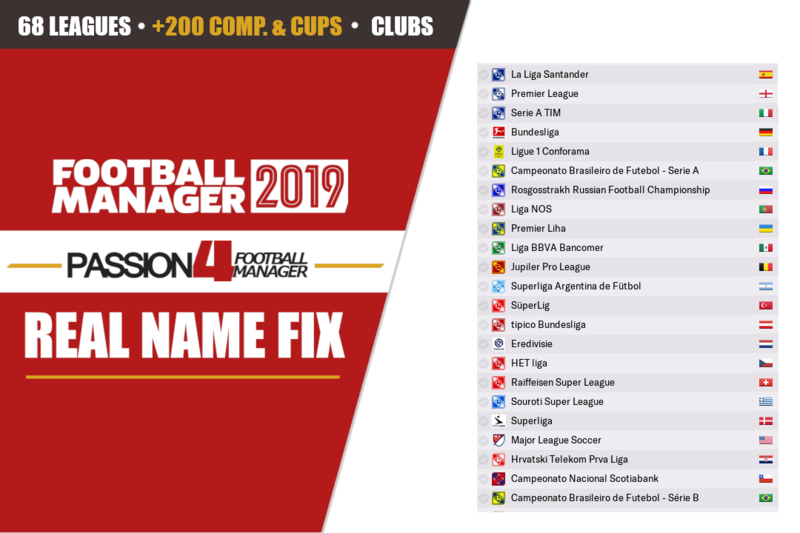 With the real names fix for Football Manager 2019 Passion4FM lets you get real names for competitions, clubs, managers and others that have been amended due to licensing issues. Not only will the German national team become visible but the real names fix also sorts other licensing issues, such as removing abbreviations of Brazilian clubs, alters name of worldwide cups and international competitions to its most common name or the mostly used sponsorship name as well as unlocking the Japanese league and the national team of Japan, China and South Korea. By following these instructions, you will also be able to experience the real player pics of the French and Dutch National team in Football Manager. Download Passion4FM’s Real Names Fix for Football Manager 2019 and unlock the German national team! Updated for Football Manager 2019, but works for earlier versions too. Despite Sports Interactive made an agreement with Bundesliga International for four seasons starting from the 2018-2019 season, the German national team is still “greyed out” displaying a squad full of fake names for the first team and Under-21 teams, due to licencing issues. Here we explain how you can overcome this and be able to manage or experience the German national team with real players. Here we explain how to unlock the German national team in Football Manager 2019 (or earlier versions). By deleting the fake.lnc file you will not only enable the German national team. It also removes fake names appearing for Oliver Kahn and current Dutch national manager, Ronald Koeman, appearing in the game. You will also enabe player pics of the French and Dutch national team by simply removing a file. This is something that can sort any errors you may have showing the player faces of the French and Dutch national team players, even though you may have downloaded the latest update to your preferred facepack. IMPORTANT! It’s within this lnc folder the Football Manager 2019 Real Names Fix files by Passion4FM shall be pasted into/extracted to after they have been downloaded from below! RELATED CONTENT | Download DF11 Faces Megapack 2018-2019 NOW! It’s not only the German national team that is greyed out by default. Fake names appears on the national teams of Japan, south Korea and China. The Japanese N-League will feature fake names of clubs too. Here is how to enable the real names of the Japanese leagues and competitions, unlock the Japanese national team or the Chinese and South Korean, as well as enabling the real kit colours of clubs from these nations. Once starting a new save in Football Manager all Brazilian clubs will feature a three letter abbreviation name, due to licensing issues which makes Sports Interactive not allowed to use the real name for Brazilian clubs. Luckily we have discovered a fix for getting the real club names to appear in Football Manager 2019 without the need to download a single file! This simple step must be done, no matter if you download Passion4FM’s real name fix file provided below. By deleting these files you will restore the real kits of Brazilian clubs and remove other licensing issues that’s involved. While deleting the formerly mentioned fake.lnc restores the real names of Oliver Kahn and Ronald Koeman there is one last fix to restore Ronald Koeman in Football Manager 2019. The solution is to delete an additional file. Here is the instruction to rename Jan Jansen to the actual real name of the Dutch manager. For every database update, you will need to delete the files highlighted above, since every new update to the database version will re-add these licensing files. You can simply delete the folders dbc, edt and lnc if you wish to. These folders must be deleted for every database update and new version released. But we recommend to keep them as there are files within it that features translations and fixes to specific languages for awards and letters. You will also need to re-add the Passion4FM Football Manager real names fix file to the newest database version, for example db 19.0.1 or the database version created to the coming Winter transfer update 19.3. Simply copy and paste the files from the main database version 19.0.1 to the newest update. As an essential Football Manager 2019 download, we’ve released this year version of the real name fix to worldwide competitions and clubs in FM19. By downloading the real name fix file by Passion4FM, you will be able to get the real names of competitions and clubs appearing in Football Manager 2019. Even though it’s created for FM19, the file is compatible for FM18 and hopefully FM 2020 as long as ID’s are kept similar. The download features two files, one for competitions and one for club names. It makes leagues, competitions and cups 100% authentic in Football Manager 2019. Real names of all competitions from all playable leagues in Football Manager 2019 have been fixed, plus some that is not activated by default, such as San Marino, Latvia and Qatar. This means that you will get the official name of the English Premier League or change the name of the premier division of Austria to tipico Bundesliga in additional to enable the real name of the Toulon youth competition for example. We have also included a real name club name file, which sorts issues like the abbreviation used on Portuguese club SLB, which are originally SL Benfica or the fake name used of Club Atlético Osasuna, entitled Atlético Pamplona. A long range of other clubs in the world has also received their original name, such as real club names of Albania, Spain, France and Serbia. UPDATE 2.1 A new small patch was released 1st of November which includes the real names of Brazilian State Championships and Under-20 competitions. We will continue the work on these files to update Football Manager with more real names of competitions and clubs from unplayable leagues too! Stay tuned! A file that removes fake names and licensing issues in Football Manager 2019. Passion4FM’s Football Manager 2019 real names fix lets you get the real name of competitions and clubs, cups and tournaments in every playable league appear in Football Manager. It even works for Football Manager 2017 and Football Manager 2018! Download the latest version of Passion4FM’s real names fix files. Use a tool such as 7-zip, or WinRar for Windows to extract its contents. Mac users need The Unarchiver in order to extract the content. Experience an even more realistic Football Manager 2018!